Important: a weekend surcharge of $33 may apply to travel on Friday, Saturday or Sunday. 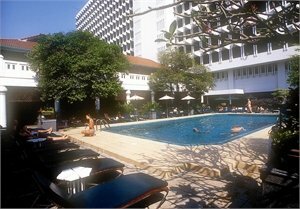 A long time favourite with New Zealanders, the Indra Regent is ideally located in the heart of the bustling Pratunam district. 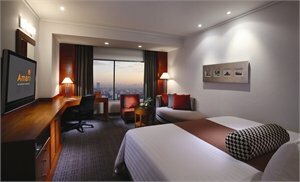 With vibrant markets on your doorstep and CentralWorld and Platinum only a short walk away, this hotel is an ideal base for shopping and sightseeing alike. 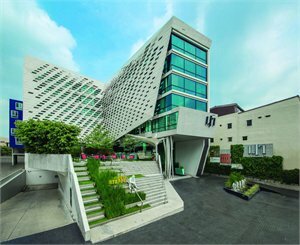 LiT Bangkok Hotel & Residence offers an ideal location just 5 minutes’ walk to major malls such as MBK, Siam Paragon, Siam Discovery and close to attractions and landmarks including Bangkok Art and Cultural Centre, Jim Thomson’s House and The National Stadium Sky Train station. Nestled in the heart of a bustling downtown neighbourhood known for its vibrant landscape of street bazaars and shopping malls, Amari Watergate Bangkok offers a glimpse into contemporary Bangkok and its ever-pulsating energy. Close to the Skytrain and Shopping malls. NOTE: Fri-Sun stays may incur a surcharge during Feb-Mar 19. 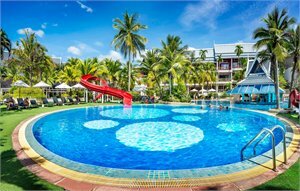 Best Western Phuket Ocean Resort is an excellent value resort situated on the hillside at Karon Beach. Set among the coconut groves overlooking the Andaman Sea, the resort is a five minute walk to Karon Village and a short drive to the hustle and bustle of Patong Beach. Set a short distance back from the beach, Horizon Karon Beach and Spa enjoys an elevated position to ensure great views. The resort is of contemporary Asian design and comprises of two wings with each wing surrounded by lush tropical gardens and boasts its own private pool complex. Shops and restaurants are within easy walking distance, and it’s more relaxed and quiet setting is the preferred choice of families and couples. FAMILY OFFER: Family with kids will receive a 20% discount on food and beverage consumed during the stay, a 20% discount on spa and free babysitting at the Kids Club for a child aged 4-11 years old during 9am-6pm. Valid for bookings with at least one adult and one child in the room. The Old Phuket Hotel is located in the middle of tranquil Karon Beach. Sitting on a private road among the shopping and entertainment, the hotel is only a few minutes walk from the white sandy beach. Enjoy a unique holiday with the best of both worlds accommodation spread over two distinct wings each with its own pool. 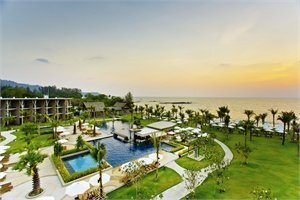 Formerly known as Kata Beach Resort & Spa, this property is ideally located on the absolute beachfront of Kata Beach with numerous restaurants & shops a short stroll away and Patong Bay a 20 minute drive away. 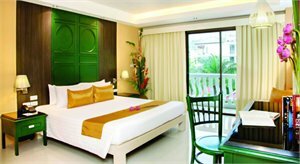 An evergreen environment adds enchantment to this comfortable and popular resort. Set on private Tri Trang beach amongst 12 acres of lush gardens, swaying plam trees and surrounded by a fantastic pool, which offers a great place to relax and unwind. Located just 3km from Patong. Stunning beachfront property, perfect for families and couples with an array of facilities and first class service on offer. 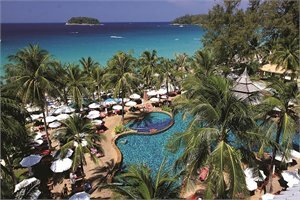 The hotel rests on the soft, golden sands of Nang Thong Beach and is embraced by lush green hills. Located in Khao Lak centre, only an hours drive from Phuket Airport. 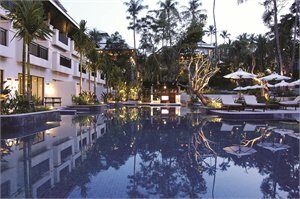 NOTE: ENQUIRE NOW to combine 4 nights stay with 4 nights at the Katathani Beach Resort in Phuket. Includes: Breakfast daily, Return transfers from Phuket Airport to Khao Lak. With the perfect location in central Chaweng, Chaba Samui is ideal for beachside relaxation. Set in tropical gardens, choose between the Lake Building or the Ocean Building rooms, with private balconies and direct beach access. 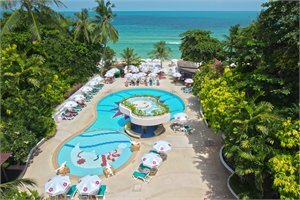 The resort spans both sides of the road and offers one of Koh Samui’s most popular beaches, shopping and nightlife right on their doorstep. Bonus: FREE late check-out to 2:00pm (Subject to room availability), (valid for travel 1 Sep - 9 Dec 19 only) FREE Welcome drink, fruit and flowers in room on arrival. 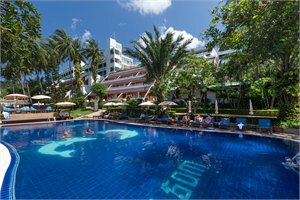 Perfectly located towards the peaceful northern end of beautiful Chaweng Beach, Chaba Cabana Beach Resort if set in landscaped tropical gardens and only minutes from the buzz of central Chaweng. Each room features a private balcony with stunning views. Unique designs are incorporated throughout the resort to ensure a tropical experience. Bonus: FREE late check-out to 2:00pm (Subject to room availability) (valid for travel 1 Sep - 9 Dec 19 only), FREE Welcome drink, fruit plate and flowers in room on arrival. Located beachfront on Thongson Bay, 15 minutes drive from Chaweng Beach. The resort has large grounds and extensive facilities, including a top of the line spa and luxurious villas. Formally known as Krabi Thai Village Resort, the resort features spacious rooms with a big balcony area which have recently gone through a full fresh refurbishment in early December 2018. Enjoy the service and friendly atmosphere. Nestled on the forest foothills of Phra Nang Bay is the luxury haven of Cha Da Thai Village Resort, simply enchanting and offering modern comfort in traditional style. Located in Ao-Nang. Holiday Inn Resort Krabi is perfectly located across tranquil Ao Nang Beach, only a short stroll to dining, shopping and entertainment areas. Its the ideal base to explore what Krabi and the nearby exotic islands and national parks have to offer. PACKAGE TERMS & CONDITIONS: It is our policy to present the cost of our holidays inclusive of all airport and government charges. Please accept however that these charges are not within our control, therefore we reserve the right to pass on any increase.. Travel agent professional service fees where charged, will be additional to the advertised prices. Closeout and blackout periods apply over school holidays and peak holiday periods & availability of seats & rooms is likely to be very limited over this time . Please note that any Airline generated ticketing time limit which is earlier will over-ride this. Valid for sales to 30 Apr 2019. Valid for travel commenced and completed within the period 1 May 2019 to 11 Dec 2019 (unless otherwise specified). Minimum: 4 nights / Maximum: 3 Months.Prices are ex Auckland. Pricing is ex Auckland, Wellington and Christchurch, please enquire for other domestic points. Please note this is a wholesale fare. All fares are subject to change without notice. Fare offer is not valid unless all conditions are strictly complied with. Bookings are eligible to accrue KrisFlyer frequent flyer miles. Fares are valid on SQ286, 285, 298, 297, 296, 295, 291, 292 and SQ codeshare on NZ operated services SQ4281, 4282, 4284. Valid on all New Zealand AND Domestic Trans-Tasman flights operated and marketed by NZ (NZ or NZ codeshare flight numbers) except NZ300-319, NZ3000-3199, NZ3700-4999, NZ7000-7998 and NZ9000- 9999. Max stay: 3 months. Book: SQ international "N" Class. For domestic within New Zealand, book SQ/NZ flight numbers in "L" Class. Routing: AKL/CHC(SQ) SIN (SQ/MI) BKK/HKT/USM and v.v, WLG(SQ/NZ)AKL/CHC(SQ)SIN (SQ/MI) BKK/HKT/USM and v.v,WLG(SQ)MEL(SQ)SIN (SQ/MI) BKK/HKT/USM and v.v. Important: a weekend surcharge $33 apply to travel on Friday, Saturday or Sunday.Surcharge applies to ex. Ticketing Time Limits: all bookings will be appended with the applicable ticketing time limit, and this will auto-cancel at the local time the booking was made, irrespective of weekends or public holidays. If any of the ticketed segments are changed, a new ticketing time limit will be implemented. Sales till 30 Jun 19 unless sold out prior. No ticketing after sales end date. FARE BASIS: NQ5NZRL 'N' Class 'Economy Lite Fares' Pricing is correct as of 10 APR 19. Pricing and availability is subject to change at anytime. Prices shown are based on per person costs in New Zealand Dollars, for payment by cash, cheque or eftpos only. Credit card sales not permitted unless Travel Agent acts as a merchant. Capacity limitations apply and may not be available on all services. Travel requiring an overnight stay in New Zealand will be at passengers own expense. Events beyond our control such as currency fluctuations and changes to the price of aviation fuel may result in prices variations . Strict cancellation fees apply. Packages are based on consecutive nights. For split stays please contact your travel consultant. For full terms and conditions and cancellation fees please contact your local travel agent for more information. Trade enquiries via GO Holidays. ISSUE DATE: 10 APR 19.